This week I have spent not only working on my current bookbinding projects, but also planning and building some things for my new workshop. For almost a year I was hoping to rent a room for my bookbinding classes and for my woodworking projects. However, spending a third (or more) of my salary seemed unreasonable. Fortunately, my mother’s apartment stays empty ten or eleven months per year. Past spring I have moved all of my woodworking stuff there. It appeared to be a smart decision. I finally didn’t have to care about all the dust and shavings that were produced by router, table saw, etc. 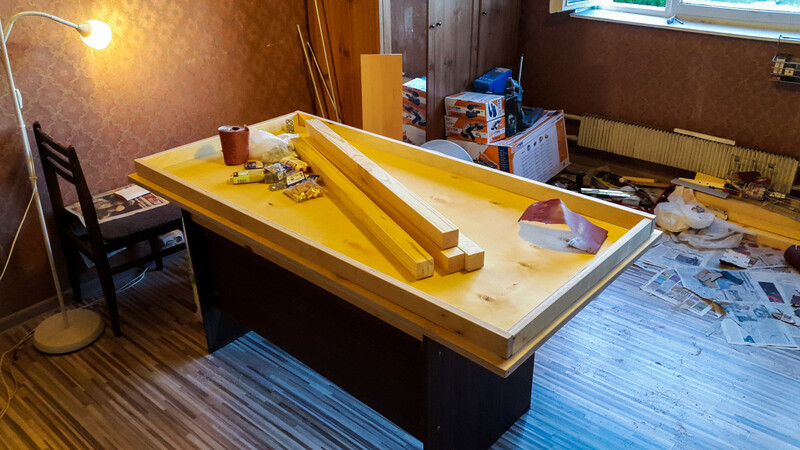 It is much easier to spend a day or two right before my mother’s visit to Moscow cleaning the whole apartment, than to clean the living room in the apartment where I live after every woodworking session. Now it is time for a new season of my bookbinding classes and I have decided to go one step further. I plan to turn one of the rooms of that apartment to a bookbinding class (keeping the function of the woodworking workshop). My typical class is five to ten students. This means I need to make five new tables (two students per table). Another table should be reserved for me. I also plan to adapt that last table for my woodworking needs too. The only problem is the price. Even while I’m making every piece of furniture for my new workshop with my own hands, I had to spend almost a $100 in materials on every table. And spending $500 on tables is not an option for me right now. Finally, I’ve settled on spending a total of $100 on five tables. That meant that tables would be not so tough and sturdy, but good enough to last at least for a year. Table tops would be made of 21 mm plywood. I also plan to make at least one table like in the video above, but a bit later, when the first income of the new season comes. Initially I have planned to post a full report on how I’ve made these tables. Unfortunately after my friend Pavel and I prepared all the needed pieces, I have found that my drill and screwdriver are left at home and we have no chance to finish the job. 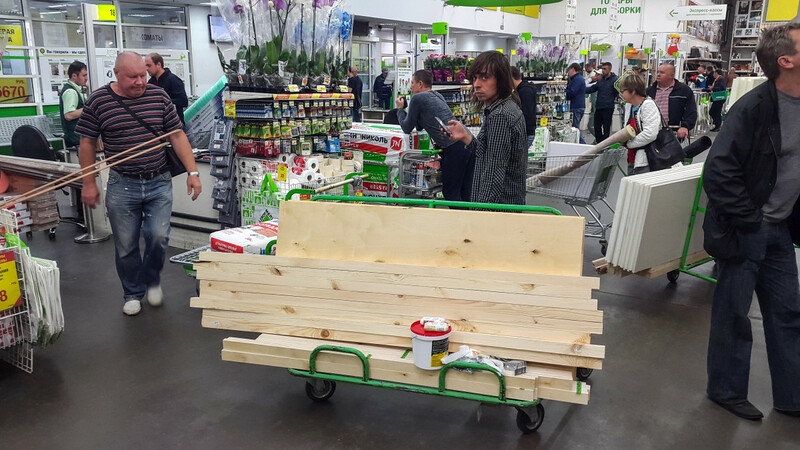 Plywood (1525×1525 mm) was cut in halves at the store. One of the pieces was cut into 50 mm wide planks to make the reinforcing beams. Legs are 50×50 mm beams. Table top appeared to be larger than I have initially imagined and I plan to add four diagonal planks in the corners to prevent the plane in from curving and bending. I would be really grateful if you share some smart ideas on how your working place (or your class) is organized. I also plan to write a post about different holders and stuff (for brushes, paper, instruments and stuff, you know) and your input on the matter would also be highly appreciated! ‹ Quick Question About Soft Weights (Yes, Soft Weights Again!) › Paper, Leather, Cloth: How Do You Store It?